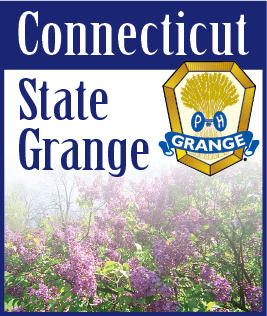 The 127th Annual Session of the Connecticut State Grange will be held Thursday through Saturday, October 20 - 22, at the Hartford Plaza Hotel, East Hartford. Approximately 60 Granges representing Community Granges across the state will send delegates to the Convention to debate resolutions and policies on subjects ranging from the closing of local rest areas to Saturday mail delivery to handicap accessibility. The delegates will work on resolutions dealing with a variety of internal Grange organizational topics. Resolutions passed at the session will become policy of the Grange and will be lobbied for by the Connecticut State Grange Legislative Committee at the Connecticut State Legislature. Those resolutions pertaining to national policies will be sent to the National Grange Convention, to be held this November in Oklahoma, where delegates from across the country will consider them. National Grange President Ed Luttrell will be the National Representative at the Convention. While Luttrell has visited Connecticut several times, this will be his first visit to the Connecticut State Grange Convention as National President. During the Convention, awards and recognitions will be presented to Community Granges and individual members for achievements over the past year in a wide variety of categories including agriculture, membership, public relations, and community service. Scholarships will also be presented. For more information on the Convention, visit the Connecticut State Grange website at www.CTStateGrange.org or call the CT State Grange Central Office at (860) 633-7550. About the Connecticut State Grange: The Connecticut State Grange has been an integral part of rural and non-rural communities across the state for over 125 years, with currently nearly 60 local Grange chapters in Connecticut. Local Granges are committed to bettering their communities through service projects, legislative initiatives, and family orientated activities.